Last Day Bible Prophecy: Is Israel Surrounded By His Enemies? This is geographical truth and cannot be denied. Once i noted last year iwas shocked how true is God's word and how we should change the way we interpret the Bible Prophecy. I am glad someone else has the same idea! Hasn't the destruction of Jerusalem and Jewish exile which Jesus prophesied of in Luke 21:20-24 already been fulfilled in the 70 A.D. destruction of the Temple (Luke 21:5-6; 19:41-44) by the Romans and the Jewish Diaspora/exile? When Jesus said that "Jerusalem will be trampled underfoot by the Gentiles until the times of the Gentiles be fulfilled" he was prophesying about what has been going on over the past 2000 years since the 70 AD Diaspora. 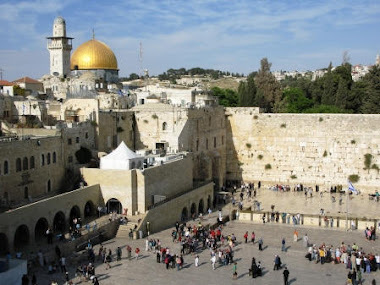 And now that the Jews have been officially regathered to their homeland (since 1948) and East Jerusalem recaptured in 1967, the only thing that remains for the "times of the Gentiles" to be fulfilled is the rebuilding of the 3rd Jewish Temple. THEN the last days "end of the age" events in Matthew 24, Mark 13 and Luke 21:25-28 leading up to Jesus' Second Coming will be fulfilled. Jerusalem may be re-destroyed, but clearly Luke 21:20-24 is talking about PAST events already historically fulfilled. "For the days shall come upon thee [the CITY of Jerusalem], that thine enemies shall cast a trench about thee, and compass thee round, and keep thee in on every side, And shall lay thee even with the ground, and thy children within thee; and they shall not leave in thee ONE STONE UPON ANOTHER; because thou knewest not the time of thy visitation. (Luk 19:43-44)"
"And Jesus said unto them, See ye not all these things? verily I say unto you, There shall not be left here one stone upon another, that shall not be thrown down. (Matt 24:2-3)"
"And Jesus answering said unto him, Seest thou these great buildings? there shall not be left one stone upon another, that shall not be thrown down. (Mark 13:2-4)"
"As for these things which ye behold, the days will come, in the which there shall not be left one stone upon another, that shall not be thrown down. (Luke 21:6-7)"